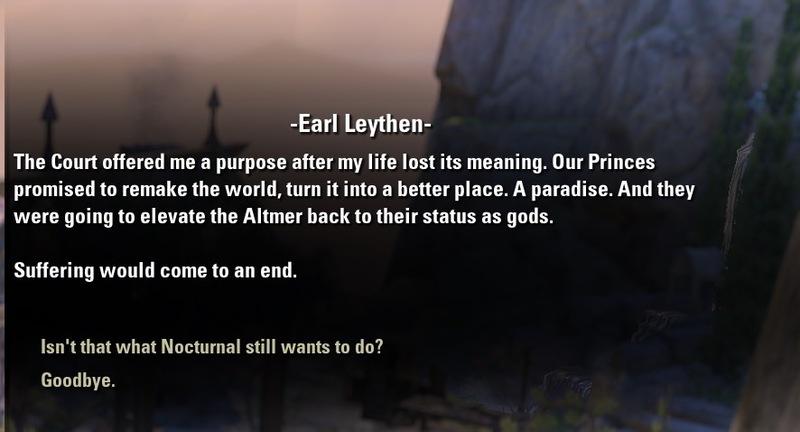 I was confused by Leythen's motivation for helping the Daedric Princes in the Summerset plot. He seemed to believe that the daedra he was serving legitimately wanted to create a utopian world. This was very strange to read. It's well known that the daedra have no interest in doing any of what Leythen says there (there is a mountain of literature on their nature). It's fine for someone like Veya to fall for their lies because she was young, disillusioned, and vulnerable (and comes from a society and organization with a history of daedra worship). But Leythen was a high ranking Psijic. He spent hundreds of years studying the Daedra, and likely even interacted with them on a number of occasions (Oriandra said it's not unheard of for Psijics to contact the Princes when they need to). I found it strange that he would make a pact with them under the belief that he was making a better world. Had he made a bargain with Mephala to bring his daughter back if he helped her, it would have been much a much more believable motive. Anyone else feel the same way? Or is what happened actually consistent with the lore and I'm missing something? Well, there's a couple possible levels to it. Possibility A: The Daedric Prices are actually lying and fooling these silly mortals into thinking they mean to keep their promises when the Deadra actually plan to do their own thing. Possibility B: The Daedric Princes do intend to remake the world into a better place, just on their own terms which these silly mortals may not comprehend. Possibility C: The Daedric Princes do actually intend to keep their promises in exactly the way their followers expect. As for Clavicus Vile, we can assume that he's going for Possibility A or B, since that's sort of exactly what he does. In Skyrim, we see with the Rueful Axe and his vampire followers that Clavicus Vile is very fond of "exact words" type promises and bargains you have to examine very, very carefully. Chances are that Clavicus Vile does intend to remake the world to he can technically be keeping the bargain, but probably not in the way his followers want. Mephala is interesting.She's one of the Three Good Daedra of the Dunmer, but, well, "Good" doesn't exactly mean what you'd think when it comes to the Dunmer or the ancient Chimer. The teachings of Mephala, Azura, and Boethiah tend to be more of the type where "What doesn't kill you makes you stronger" and we see that reflected in a lot of Dunmeri culture. So its entirely possible that Mephala does intend to remake the world. She's already helped one group of former Aldmeri (the Chimer), so its not entirely strange that she'd return to having Altmer followers like Leythen. She also is striking against the Tribunal who usurped the Three Good Daedra, as we see in the plot against Sotha Sil and likely in her request to speak with Sotha Sil right before we go to Crystal Tower. From Mephala's point of view, the Tribunal are usurpers, likely murderers, and certainly will prove to be disastrous as rulers of Morrowind, so she may well be doing everyone a favor by trying to remove them. In the end, I don't think we hear enough of Mephala's stake in the matter to guess which possibility she'd fall under. I'd guess she's somewhere between Possibility B & C. She probably is trying to make the world a better place on her own terms by opposing the Tribunal and dealing with some of the "weaker" parts of Altmer society the way she did with the Chimer, and may or may not want to make it better on the terms Leythen expects. If I had to guess, I'd say Leythen got the Prophet Veloth treatment from Mephala. They both saw the problems with Aldmeri/Altmeri society and turned to worshipping the Daedra instead, Veloth being taught by Boethiah and Leythen taught by Mephala. Veloth just chose to lead his followers to Resdayn, and Leythen decided to overthrow the Summerset Isles. Bascially, Mephala's got a type, and guys who are dissatisfied with elven society seem to be that type. At least, those are my thoughts. Summerset is a fairly complicated fustercluck of plots and webs that never quite work out the way anyone intended, so figuring out everyone's motivations gets complicated. Especially since we only get to see Nocturnal's end-game plan in action which was unanticipated by anyone else, so we only have the words of Mephala and Clavicus Vile's followers to go on to figure out the original Triad's end-goal. And like I said, taking the Daedra at their word is not necessarily the best game plan. I think these are the only really plausible possibilities when it comes to the Daedra. At first glance, a high-ranking Psijic failing to see the trap does seem strange, but we have to remember Leythen was grieving after the death of his daughter, had become estranged from his wife, and therefore was not thinking straight at all. I wouldn't be surprised if the Triad had promised him that his daughter would live again in their "remade world". I generally agree with you, its just that I can't completely rule out possibility C, because we never actually see what Mephala's endgame looks like and how well or not that meshed with Leythen's expectations. Furthermore, we dont know upfront Nocturnal was with Veya, but Vega seems to have been totally onboard with Nocturnal taking over everything, so there's the possibility that Nocturnal was Possibility C for Veya, while being Possibility A for everyone else.